IUFSD has adopted Lucy Calkins’ Reading Workshop (scroll down) , a “balanced literacy” approach to English Language Arts that rejects assigned reading in favor of each student choosing the book he or she will read. 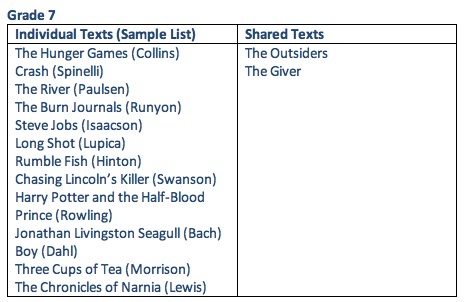 Below is a partial list of books Irvington 7th graders read during Fall 2011, provided by IMS principal David Sottile: these are the books individual children chose to read. By March, students were on track to read approximately 25 books apiece in total during the school year, all but 2 of their own choosing. The works listed below are assigned reading. 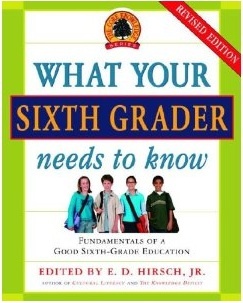 All students read, discuss, study, and write about each work in the curriculum. If Irvington were to adopt Core Knowledge (or a variant of Core Knowledge), we would be able to post this curriculum on the district website and distribute it to realtors. This is the curriculum many (perhaps most) parents want; this is the curriculum (or one like it) people pay private and parochial schools to provide to their children. NOTE: the Core Knowledge curriculum is free.